(Rome) The Vatican has ended its cooperation in the Global Freedom Network. One of the new influential men in the Vatican, the Argentine Bishop Marcelo Sanchez Sorondo no longer sits on the board of the network against human trafficking and forced labor. The backgrounds for the withdrawal are unclear. The clear step has astonished because the distancing publicly and urgently demanded by Catholics had not occurred till now. "We will not be exploited," said Vatican Insider citing Msgr.Sorondo, Secretary of the Pontifical Academies of Sciences and Social Sciences. 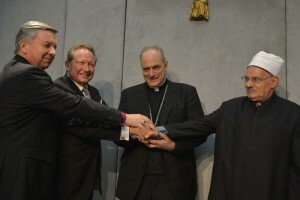 The statement surprised: Global Freedom Network was founded on March 17, 2014 as a joint venture between the Foundation Walk Free of Australian billionaire Andrew Forrest and the Holy See. At that time Pope Francis signed at the Vatican to found this interfaith network against human trafficking and forced labor, in which there were also prominent personalities of other world religions involved. The Pope's confidant, Sorondo has sat on the board of Global Freedom Network sine, which aims to sensitize the religious communities of the world against the "new forms of slavery" such as "prostitution, forced labor, organ trafficking, and trafficking in human beings". Other objectives include "promoting fair and ethical trade ', assistance to victims and survivors, pressure on governments and parliaments to raise public awareness and fund-raising for the implementation of objectives. Last December, representatives of different religions gathered with Pope Francis at the Vatican, including Justin Welby, the Anglican Bishop of Canterbury, as well as the representatives of Judaism, Islam, Buddhism and Hinduism. Global Freedom Network bad invited them to sign a joint declaration to end "modern slavery" in a media intensive event. UN Secretary General Ban Ki-moon sent a message of greeting for support. Distancing Because of "Simplistic" perspective? Andrew Forrest operates iron ore mines in Australia, with which he made his billion-dollar fortune. His group is one in the northwest of the country with 88,000 square kilometers, an area the size of Austria. On July 26, charges against him were raised in Australia: "We have someone who has a lot of money, has access to global power, who can really something happen, but if his understanding of the problem is so superficial, so undemanding, then this power, these funds will not used as they should," Anne Gallagher said in the Australian ABC television. The Australian lawyer, Gallagher was called in 2012 the "world's leading legal expert on human trafficking" by the US State Department. In 1987 she completed her studies in Law, made ​​her court internship and acquired in 1991 a Master in International Law. From 1992-2003 she worked as a UN official and as such was 1998-2002 consultant of Mary Robinson, the High Commissioner of the United Nations for Human Rights (UNHCHR).Since 2003, self-employed, Gallagher has been working under the State aid program AusAID Australian Development and External Adviser of the United Nations. A woman who, although hardly any citizens know her, carries weight at the international level of decisions. Forrest is Australia's largest private donor to charitable causes. The accusation of Gallagher against him remains very vague, yet her criticism is unusual. The alleged simplistic view of a party is usually not a reason for a disjointed public criticism or even the termination of cooperation. Forrest's company has experienced heavy losses in recent years. The declining revenues are also coupled with its foundations because charitable donations plummeted. There is criticism that Gallagher has allowed the troubled company to plunge deeper into crisis. The market reacted sensitively. According Curial Archbishop Sorondo, the Holy See had already withdrawn "some time ago" from the network. "Forrest has every right to make money, but not to use the Pope for it," said the Argentine Curia Bishop, without making any further details on this distancing. Both Gallagher and Sorondo are not clear what is alleged the Australian entrepreneur Forrest has done to fuel the crisis of his company (Gallagher) and terminate the cooperation (Sorondo). Sorondo no longer appears on the board of Global Freedom Network. He put expressly noted that this was in any case never convened during his membership. Msgr. Sorondo is regarded as an "organizer" of rapprochement between the UN and the Catholic Church when it comes to the fight against manmade global warming. Sorondo had organized, prior to the publication of the Eco-Encyclical Laudato Si a meeting at the Vatican, which was opened by UN Secretary-General Ban Ki-moon. A few days ago he received 70 leftist mayors and other politicians in the Vatican to discuss the fight against man-made global warming and new forms of slavery. The distancing of Global Freedom Network , shows that the narrow circle around Pope Francis knows how to be sensitive, and knows how to draw a clear line and make it known publicly. Although the reasons for this distancing are unclear, it is done. No distancing from a children's book series which will appear in the name of Pope Francis for gender ideology. The Foundation Scholas Occurrentes, a worldwide network of schools was established on the initiative of Pope Francis in August 2013 at the Vatican. 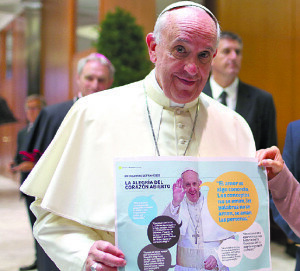 The Argentine newspaper Clarín have been publishing since spring 2015 in cooperation with the Pope Foundation in Spanish, the children's book series, "With Francis at my side." The children's stories, which are now widely circulated in Spain, advertise homosexuality, transexuality and "new family forms" on behalf of the Pope. The children's book series is promoted with the image of Pope Francis, it was photographed at the Vatican. The driving force behind the establishment of the foundation Scholas Occurrentes was also the Argentine Archbishop Marcelo Sanchez Sorondo. The establishment took place in a ballroom run by Sorondo's Pontifical Academy of Sciences. Both Scholas Occurrentes and the Vatican wash their hands in innocence. Nobody wants to have known something or anything to do with the contents of the children's book series. A distancing has not taken place until today, although the book series coincides with Pope Francis' image, stabbing Catholic initiatives in the back with the portrait, trying to clarify the aims of gender ideology and roll back their influence. The newspaper publisher Clarín continues, meanwhile, negotiations with other newspaper publishers to translate the children's books into other languages ​​and spread them to other countries. "We've always been at war with Eastasia." When it comes to Vatican 'haupt politik' I'm still caught by surprise by the willing inter-meshing of the post Vatican II RCC with international high finance, the UN, and a multitude of crackpot leftist schemes. Perhaps it has always been so, certainly Pius IX flirted with those forces until they turned round and bit him in an uncomfortable place. This involvement by the Vatican of Pope Francis with the gener ideology and the children's books which present and promote homosexuality, transgender people etc. is outrageous. The Vatican can't protest in innocence, because there we have the photograph of Pope Francis posing with the children's book. What a disgrace of a Pope. He has to be mentally ill, or really and truly influenced by the devil, as are so many of his associates. Yesterday, I came across an article on the internet from Fox News which asked " Why do so many people, including Catholics now hate Pope Francis?" 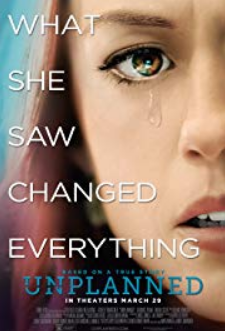 This scandal/issue about gender ideology is one of them. I would not say the word "hate", but I have always had a dislike for this Pope, and every day, wish for the good of the Catholic Church that he and his associates will soon be gone. This feeling is prevalent in Italy, which is sad because no people used to love the Pope and applaude him more than the people of Italy. Even for foreign popes like JP II and Benedict XVI. But they hate Francis......and with good reason. And it's increasing. Pope Francis is suppose to defend the Catholic Church and the Flock of Jesus Christ. Not change the Catholic Church. Wonder how long before Coca Cola or McDonalds gets the Holy Father to pose for a picture with one of their products or advertisements. I guess this is one of those smarter-than-you-realize "Jesuit things" that most people simply do not have the brain power to understand. burger King's already basically done it...and I understand they still have the altar used during francis' trip. This has all gotten beyond the scratch-your-head absurd moment. That this clown would actually pose with that diabolical book aimed at the damnation of children, is beyond words.....evil! If the Vatican was Catholic they would not "distance themselves" from sin they would engage it head on and CONDEMN IT. I was trying to find the book online. Does anyone have a link to it? This is incredible!!! How does one even respond to something as horrendous as this??? All Francis is doing is making enemies. Good Catholics increasingly hate him, and his associates. I believe that there is either jealousy or pride on the part of Sorondo that is behind this move. Jealousy, because there is someone else besides him who is bringing people from all faiths together to work against slavery, child trafficking and prostitution. Pride, because he does not want to be seen associating with someone who is not from the left. (Forrest is centre). Mr. Forrest has rich mines and uses them to train and to employ aboriginal people. He donates a lot to St. Vincent De Paul and other charities. He and his wife, Nicola, Pledged half their wealth to charities while they lived. Mr. Forrest – whom I have never met – comes across as the rich landlord that Jesus praised in a parable. The one who went out hiring laborers throughout the day enabling people to feed their families! Jesus, by the way, did not hate rich people or capitalists. I believe Sorondo should go. Of course! The defence of the scandalous acts and omissions of the Holy See is nauseating.